White Papers from Telinta offer thought-provoking ideas and educational resources to help your business grow. 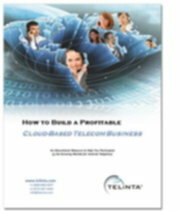 Learn how cloud-based solutions can take your telecom business to the next level. This paper explains how to put all the pieces together so that you can offer a rich portfolio of profitable telecom services to your customers. This educational resource explains important details and decisions, helping you to start a successful Hosted PBX business. This will help you to better understand how you can provide profitable cloud-based VoIP services to your business customers, virtually anywhere in the world. Learn how to build a successful Calling Card business, serving your end users, resellers, distributors and agents. This educational resource explains how to get started offering brandable Calling Card and Pinless services without owning any infrastructure. 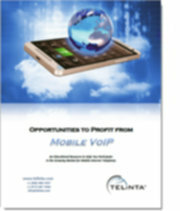 The opportunity for you to offer Mobile VoIP has never been better. This paper looks at industry growth for Mobile VoIP, and is an excellent resource to help you get started offering profitable Mobile services to your end users and resellers. WebRTC is one of the fastest-growing parts of the VoIP market. This white paper provides important info to help you to get started with WebRTC, explaining the key decisions and options you will need to address to take advantage of this attractive opportunity.